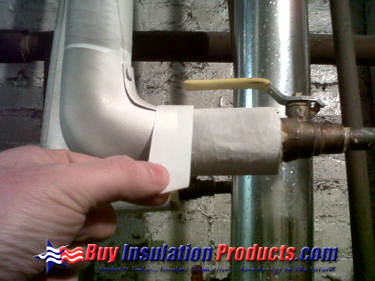 This tutorial uses a few photos to show the simple steps of how to insulate a pipe elbow with a PVC Fitting Cover. 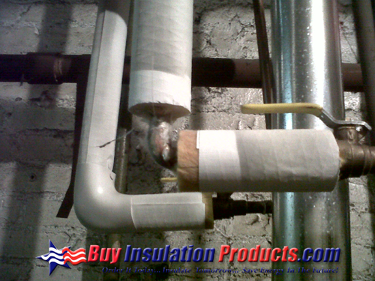 When you are insulating pipes with elbows, using a PVC Fitting Cover makes your job easy and makes the finished project look clean and professional. 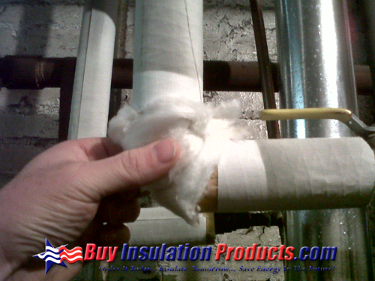 Remember to keep the fiberglass pipe insulation as close to the elbow as possible. 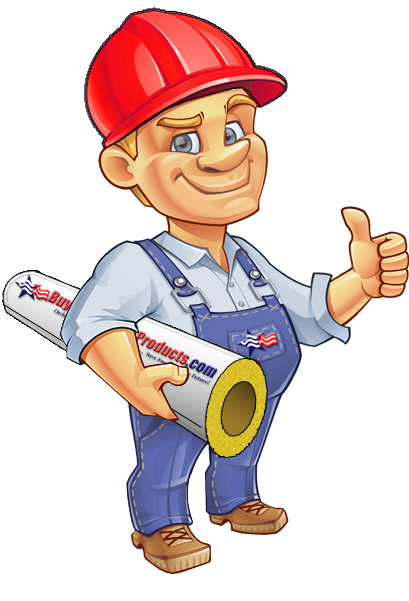 Each PVC Fitting Cover will come with a Fiberglass Insert Wrap which should be wrapped around the elbow to make sure the entire pipe is insulated. 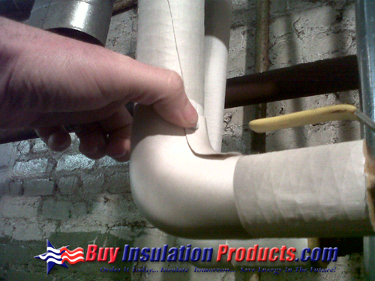 Place the molded PVC Fitting Cover over the Fiberglass Insert Wrap and overlap the inside flaps to make a tight fit on both pieces of Fiberglass Pipe Insulation. For the most secure closure, we recommend the use of Serrated Stainless Steel King Tacks which are small serrated thumb tacks that will pierce the two layers of PVC and hold them securely. On smaller fittings only 2 King Tacks are necessary, on larger fittings 3 or more are suggested. 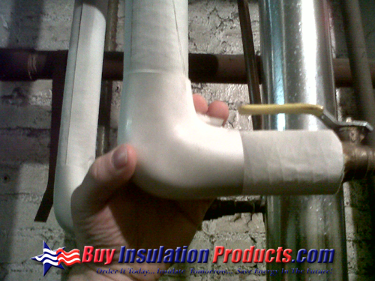 White PVC Vinyl Tape can be used to seal the seam between the PVC Fitting Cover and the Fiberglass Pipe Insulation. 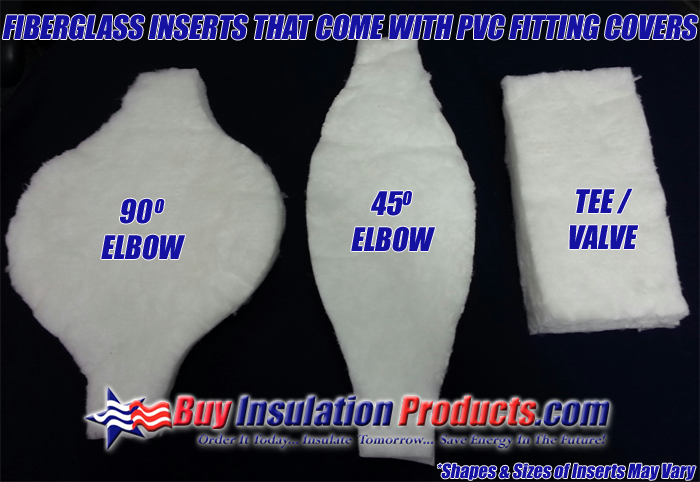 *The first step in purchasing PVC Fitting Covers is figuring out what PVC Size you need. 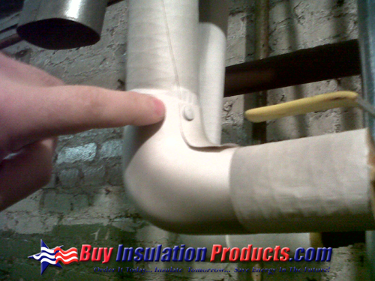 The PVC Size is based on the size of the pipe and the thickness of the pipe insulation you are using.